If you have ridden on an equine trail in the State of Wisconsin and would like to provide a review of this trail, please complete the form below and click the submit button when you have finished. Your on-line submission will be reviewed and posted on our website for everyone to read. We hope that this new application will help everyone who utilizes the equine trails in the State of Wisconsin. This on-line form is a way for anyone who visits this page to submit a trail review of an equine trail in Wisconsin. Things to consider when reviewing a trail might be restrooms, signage, parking, access, trail conditions, etc. Please provide as much detailed information on this trail as you would like. This will help anyone who would like to visit this trail know what to expect, as well as it will help the WHC Trail Grant Committee know how funds are being used to better the trails. Once you have submitted your review, it will be reviewed by us and posted on our website. Here are the on-line Trail Review submissions that you have sent to us. Thank you! Wonderful ride of about 7 miles in this reopened campground. Rolling , mostly wooded terrain. We rode this after a big blow down and was very pressed by the condition of the trails. 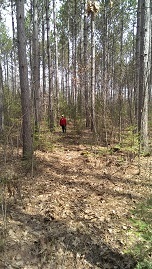 Even through the trail was cleared you could see areas where the storms took down acres of big forest. We rode in mature pines and aspen forest and the trail was wide enough to ride two abreast in most areas but occasional spots of single track. One very nice watering spot at Sunken Lake, with hard sand bottom and gentle slope. This is just one loop of the Saddle Trail and we took the sandy road back to camp as it was getting dark. Campfire and horses on the high ties. Fall and no bugs. Hopefully the campground will get the well repaired soon so campers don't have to haul water. On a cool, cloudy, and rainy week end in October the Clip Clop Riders provided an open house for the Middle Inlet Horse Camp, in Marinette County. If you thought they did not have a very successful weekend you would have been wrong. This hard-working group of trail riders hosted at least 28 rigs, more than 40 horses and over 70 people! The club provided trail guides for those who were not familiar with the trails and a very impressive potluck dinner. After dinner the club was presented with a check from M & M Area Community Foundation for $1180.00. Clip Clop Riders have also received a $500.00 grant from CellCom along with the grants from Wisconsin Horse Council. Most notable was the check provide by the the Great Northern Paint Horse Club for $4,100 to assist with their projects. The Clip-Clop Riders club was established in January, 2016 with a vision to work with State, County, local and private land owners, along with land management organizations to develop and maintain trails for horses and other non-motorized use. In the spring of 2016, the club established a horse camp and trail system in the Middle Inlet area, in Marinette county. The trail head accommodates rustic camping and provides high lines for your use, although pens are also acceptable. A pit toilet has been installed and a well was dug at the end of October in 2017. Camping is by a county permit that can be purchased at most gas stations in the area. The permits are valid for the year and cost $12.00 and only $6.00 for those 65 and older. The trails are primarily single track and do require some technical riding to avoid rapping your knees on the trees. They are very clearly marked and follow the trail map well. There are three loops that intertwine - red, green, and black. The trails are not rocky if you are concerned about the footing. If you enjoy a more active ride, though not difficult, these are some trails you would appreciate. There is no cost to ride the trails but donations are always accepted. In January of this year the Clip Clop Riders met with Marinette County Forestry and Parks Department and developed a 5-year plan for camp and trail improvements at the Middle Inlet Equestrian Trail System near Lake Mary. Specific goals discussed were to expand the camping area and add more picnic tables and fire rings, along with the well. This was a clear indication of the popularity of these trails. In the very short time these trails have been available for riding, this particular destination has become a favorite of mine in the north woods. I encourage you all to make the trip to Middle Inlet and ride these wonderful trails. The Clip Clop Riders always welcome new members with what I consider a nominal membership fee. They do have a Facebook page if you are interested in looking up the club. County Rd X to the East to Lake Mary Rd. Forest Rd. 901 for 2 miles. The Horse Camp is on the left. Hats off to Northern Saddle Club! I rode the trails at Halls Creek and Horseshoe Falls this year and they are both fantastic! The vision of the Northern Saddle Club is to work with landowners and land management organizations to preserve and ensure safe riding areas for our present and future equestrian enthusiasts. They are an organized and family oriented trail- riding group that maintains three different trails within a twenty-mile radius. The trails that they maintain are Halls Creek, Bush Lakes Flats and Horseshoe Falls. Halls Creek horse trails are also located in Florence County where over 50% of the land is publicly owned giving you access to miles of riding. There are endless miles of forest roads that can be explored along with trails traveling through a mixture of hardwoods and open fields. The trails are very well marked with white carsonite post signs and color-coordinated for easy to navigation. The trailhead at Halls Creek provides picnic tables and fire rings for rustic camping as well as a pit toilet. Camping is free and no reservations are needed. When camping at Halls Creek you can use portable fencing or high line, whatever your preference. Hwy 8 , 1 mile West of Dunbar, go North on County Rd U. Follow County U till you come to the 4-way stop where you turn West (Left) onto County Rd C. Go 3 miles; go past LaSalle Falls Rd, past Rifle Range Road-the next road on the right is Halls Creek Rd. Turn Right, you should see the Equestrian sign. Go 1.3 miles to trailhead. When visiting Halls Creek I would recommend you also check out Bush Lake Flats. There is a 7 mile connector trail allowing you to ride from one trail system to another. The Bush Lake Flats trails are approximately eleven miles long, but the entire forest is open for riding. Most of the trail is a single track, with a surface of sandy soil or grass. These are easy trails with no real challenging areas; this makes it an excellent trail for novice riders and green horses. There is free rustic camping available at the trailhead and water is available. The Bush Lake Flats trails are 4 miles West of Halls Creek Road on County Rd. You won’t find the Horse Shoe Falls trails listed in the Wisconsin Horse Council trail book because they were developed since that publication. These trails are an absolute pleasure to ride and are marked better than most trail systems. I do want to thank Alan and Janet Bird for their hard work on these trails, they have worked tirelessly, along with other members of the Northern Saddle club, to make this possible. Rustic camping is available and there is a pit toilet at the trail head. Like Halls Creek, there is no water pump, but there is water for the horses from the creek located at the trail head. Horse Shoe Falls camping requires a Marinette County Park Sticker. The sticker is good for the year and can be used for all of Marinette County Parks, including for camping at the Middle Inlet horse trails. Stickers can be purchased at local businesses in Marinette County including Aberg, Beecher, Dunbar, & Pembine. If you haven’t ridden there yet, make sure you check these trails out. From Hwy 141 go west on County L or Beecher Lake Rd. Follow that for 1.5 miles to Semesters School Rd. turn left for .6 miles and turn right on Trout Haven Rd. Go west for 4.8 miles, you will see the signs put up by Marinette County directing you to the trailhead. A new horse trail is being developed in Marinette county (District 2) by the Clip Clop Saddle Club. Sheena and Rob Wenzel are spearheading the development of this trail. 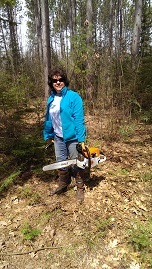 On April 30th, Clip Clop had a work day and Trail Committee members Patty Wisneski and Carrie Quatsoe joined them to help with their project. On a cloudy Saturday we made new trail, put together trail marker posts and installed them, put together and stained picnic tables, made a kiosk, and marked the new trails. Whew! A very busy day! These trails show much promise and look to be a fun ride. The directions to the Middle Inlet Trails are from Highway 141 in Middle Inlet take Highway X east. Follow this to Lake Mary Road and then turn left (north). Look for Forest Road 901 and turn left onto this. The campground / trail head is about two miles down the road on your left. If you camp you'll need to pick up a sticker from Marinette County. Camping is rustic, so bring high lines or pens for the horses and your own water. Clip Clop received a trail grant from the Wisconsin Horse Council to proceed with this project. It was nice to see the money being well spent to introduce new horse trails for the public. 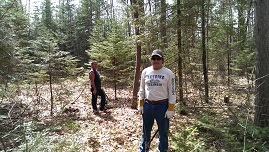 LEFT: Clip Clop Saddle Club work crew.................RIGHT: Glenn Wisneski & Chris Quatsoe clearing brush. LEFT: Carrie Quatsoe working on the trail.......RIGHT: Patty Wisneski on the newly developed trail. 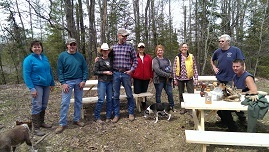 The Northern Saddle Club is proud to thank Pete Vilas and his crew of the Marinette Forestry & Park Department for the large expansion at the HorseShoe Falls Equestrian Trailhead. Funding for the project came from a grant received by the Northern Saddle Club from the Wisconsin State Horse Council Trail Grant Program. Horse Shoe Falls Equestrian trail system is located near Dunbar, WI. The parking/camping at HorseShoe Falls Equestrian Trailhead has been enlarged and has pull thru parking for large horse trailers. Additional miles of trails to ride were also completed this summer. Please visit the club’s website at www.northernsaddleclub.org . Club membership forms and maps of the trails can be found on the website. If you have questions, please email the club at northernsaddleclub@yahoo.com or call President: Dave Wells 906-282-1626 or Vice President Patrick Petraska 906-828-3005. The Northern Saddle Club is a non-profit organization that relies on club membership dues, fundraisers, and donations. Donations can be mailed to: Northern Saddle Club, PO Box 312, Florence, WI 54121. All donations will go towards trail improvements. Click on the link below to view a map of the trail system. Have you ridden the Halls Creek horse trails located in Florence County yet? More than 50% of the land in that county is publicly owned giving you access to miles of riding. The trails at Halls Creek are very well marked with white carnite post signs and color-coordinated for easy to navigation. The camping area at Halls Creek was improved last year providing ample room for even the largest rigs. There is a pit toilet provided but currently there is no water available. The Bush Lake Flats trails are 4 miles West of Halls Creek Road on County Rd. C.
Bush Lake Flats trails are approximately eleven miles long, but the entire forest is open for riding. Most of the trail is a single track, with a surface of sandy soil or grass. These are easy trails with no real challenging areas; this makes it an excellent trail for novice riders and green horses. There is free rustic camping available at the trailhead and water has been provided, thanks in part to the generous grant from Wisconsin Horse Council. The exciting news for this year is the “Connector Trail” which allows riders to camp at either trailhead and still access the other trails! A seven-mile trail has been created connecting Halls Creek and Bush Lake Flats. The trail is clearly marked and easy to follow. This trail was partially funded by Wisconsin Horse Council’s Trail Grant Program. THANK YOU WISCONSIN HORSE COUNCIL! Until next time - Happy Trail! The Castle Rock Horse trails are located south of Hwy 21 and east of 20th Ave., all the way to the Wisconsin River, where it opens up into Castle Rock Lake on the Adams County side. The Castle Rock Horse trails are on about 2,500 acres of Wisconsin River Power Company land. The Castle Rock trails are sandy and are easy to ride. It is a favorite trail for early spring when many horses are not yet in condition for the riding season. Many of the trails allow beautiful views of the Wisconsin River, Castle Rock Lake, The Roche A Cri, Waller’s pond and other smaller ponds along the way. The trails provide a variety of riding, including pine plantations, prairies, and oak forests. Some of the trails are wide enough for a horse and cart and some of them are bridle paths. Along the trails you will see a variety of wildlife. It is normal to see deer, turkeys, sand hill cranes, ducks, badgers, eagles, ospreys, and even a bear has been spotted in the past. The six loops of the Castle Rock trail system are color coded and well marked. There are short trails within some of the main loops that are always marked with a brown sign. Most of the loops interconnect with one another so that you can tailor your ride to fit your needs. All of the trails are designed around 21st Ave. and Cumberland Ave (which becomes 22nd Ave at the corner). At each intersection; there is a number on the sign that corresponds to the same number on the trail map. It is easy to know where you are, where you were, and where you are going. The trails designated for driving are marked with wagon wheel symbols. Most of the water crossings are easy and the more challenging crossings are marked on the trails so they can be avoided if riders want. The Castle Rock Trails Club maintains the Castle Rock Horse Trails. The club consists of committed people who give of their time, energy, resources and finances to make it possible for all of us to enjoy the natural beauty of these trails. Because the Castle Rock Trails are not state owned, there are no state trail fees. This also means that there are no state monies designated to maintain the trails. The Castle Rock Trails Club depends on the donations of riders who enjoy riding the trails. All donations are greatly appreciated. Donations can be dropped off at the donation/map/kiosk center at the trailhead (located on 22nd Ave.- South of Hwy 21) or they can be dropped off in the donation box just outside the Ukarydee Campground Office. Donations can also be mailed. In the past, the Castle Rock Trails Club has been the recipient of grant monies from the Wisconsin Horse Council. With these grants the Castle Rock Trails Club has been able to provide some of the amenities. This group continues to improve the trails every year making for a very well maintained trail system. Because the land is open to public hunting riders are discouraged from using the trails during the deer gun season. For dates you can check with the Wisconsin DNR at 608 339-3385. Castle Rock Horse trails are for virtually any trail rider. The easy trails lend to training on the trail and early season conditioning. I encourage you to make this one of your Wisconsin Horse Trail destinations. Until next time – Happy Trails! 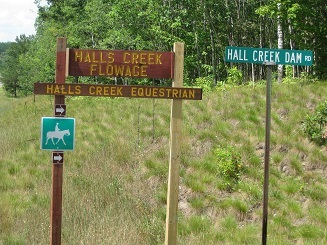 Northern Saddle Club, in cooperation with the Florence County Forestry and Parks, maintain two trails systems for equestrian riding in Northern Wisconsin. The vision of the Northern Saddle Club is to work with landowners and land management organizations to preserve and ensure safe riding areas for our present and future equestrian enthusiasts. They are an organized and family oriented trail- riding group that maintains three different trails within a twenty-mile radius. The trails that they maintain are Halls Creek, Bush Lakes Flats and also Horseshoe Falls; which will be featured in a future article. In my opinion this is the hardest working saddle club in the state of Wisconsin. Halls Creek horse trails are also located in Florence County where over 50% of the land is publicly owned giving you access to miles of riding. The trails are scenic, traveling through a mixture of hardwoods and open fields. The trails are very well marked with white carnite post signs and color-coordinated for easy to navigation. There are many forest roads and the entire forest is open for riding. I have ridden there many times and find this to be one of the best-kept secrets in Northeastern Wisconsin. The trailhead at Halls Creek provides picnic tables and fire rings as well as rustic camping. Camping is free and no reservations are needed. The camping area now offers a pit toilet thanks to the hard work of the Northern Saddle club, Florence County and a grant provided by Wisconsin Horse Council. There is not yet water available but there is the lake for watering your horses in case you run out of water. The camping area was expanded in 2014, to accommodate even more campers and the campsites are easily accessible to large rigs. When camping at Halls Creek you can use portable fencing or high line, whatever your preference. If traveling on Hwy 141 from the South, turn West onto “Hwy 8 West ” at Pembine, WI. Go about 1 mile West of Dunbar, turn North onto County Rd U. Follow County U till you come to the only stop sign. It is a 4-way stop where you turn West (Left) onto County Rd C. Go 3 miles; go past LaSalle Falls Rd, past Rifle Range Road-the next road on the right is Halls Creek Rd. Turn Right onto Halls Creek Road that does have an Equestrian sign. Go 1.3 miles to trailhead. Follow horse signs (white fiber glass signs/post) until you reach the Lake where you will see the trailhead on your right. Although this may sound like quite a trip to find the trails, they are so worth it! When visiting Halls Creek I would recommend you also check out Bush Lake Flats. The Bush Lake Flats trails are 4 miles West of Halls Creek Road on County Rd. C. Turn Left on Fire Tower Road. Go about ¼- ½ mile, turn Right, there is a well-marked wood Equestrian trailhead sign. The trailhead is about ¼ mile. Bush Lake Flats trails are approximately eleven miles long, but the entire forest is open for riding. Most of the trail is a single track, with a surface of sandy soil or grass. These are easy trails with no real challenging areas; this makes it an excellent trail for novice riders and green horses. There is free rustic camping available at the trailhead but there are no amenities available. The Northern Saddle Club has big plans for 2015. They will be creating a 5 mile trail connecting Halls Creek and Bush Lake Flats. They plan to provide water at both trails during the summer of 2015. I would like to mention the Arabian Club, recently disbanded, has contributed considerable financial support toward the various trail improvements. As I trail rider I would like to thank that group for all they have done to provide a wonderful trail riding experience along with the Northern Saddle Club. Riding season is fast approaching and I definitely recommend that you make Halls Creek and Bush Lake Flats one of your riding destinations. Our trip started in southwest Wisconsin, at End of the Trail Campground. It was a good meeting place for us, as Gail lives in Marshall, and the rest of us are from the Green Bay area. We rode Wildcat and Kickapoo for three days, and then moved to Zumbro Bottoms in southeast Minnesota. We set up camp on Sunday and were inundated with black flies, mosquitos, and gnats. We thought we would stay to ride the next day, as it was going to cool down, and possibly the bugs would get bet-ter. Monday morning we saddled up and hit the trail. The trails are nice with wide areas. There are trails that follow the river and some that climb to some beautiful vistas. I was expecting rocky trails, as that's how it was described to me, and did pack my boots but didn't need them. Unfortunately, the deer flies and horse flies were horrid. We returned to our camp only to break it down and move to our next destination two days early. We headed to North Dakota, specifically the Sheyenne National Grasslands. We stayed at Sheyenne Oaks Campground in Leonard, North Dakota, about 40 miles south west of Fargo. It is a nice campground with 12 X 12 open stalls for the horses. The campsites are pull through with the horse pens on the edges of the campground. Horses are not allowed in the camping area, so we had to bring our gear over when we wanted to ride. The first night we arrived, we had just settled the horses in their pens when a thunderstorm struck. It was quite the lightening show, and I worried about our horses out there, but they weathered it quite well. The next day dawned bright and sunny. Armed with a rudimentary map, we hit the trails. Sheyenne Oaks has some trails on their property and the rest is on federal land that is also used for grazing cattle and sheep. Each section is fenced in, but there are gates you can open to go from section to section. The rule is - if the gate was closed, close it after going through. If it was open, leave it open. You can ride anywhere on the federal land and do not have to follow the trails which may be cow paths. A GPS is a great tool in this area. The grasslands are totally different from Wisconsin. I'm used to wooded trails. This was wide open and a great place to gait or trot in safety as long as you stay on a trail. If you wander off, there are critter holes in the grass that you don't see until you're right on them. There is no running water, such as streams or creeks with easy access to water, but the land is dotted with old fashioned windmills. Very wild west. There are some trees, especially around the river, so we did get some shade. On one of our riding days we decided to take a trail that would take us in a loop along the river and back to camp. I got verbal directions from Jody, who owns Sheyenne Oaks. We made it to the river, but when we came off the ridge, we took a trail to the left and later learned we should have gone right. We could see a storm coming, so we came through some fences, when the rain started coming down. Eventually we came to a farm house and stopped to apologize for riding on their land. The elderly couple were at first upset we had trespassed and rightly so, but then took pity on us. It seems we were about 10 miles from camp. They gave us return directions and we started on our way. The winds had to be 40 mph and gusting but our horses were troopers and gaited along. We were almost to our first turn when a pick-up truck came along behind us. It was Bert, the male half of the couple we had spoken to. He had remembered there was a section road that would cut off 3 miles from our return trip and directed us to it. What a nice couple! We had camp in sight when the rain let up and the sun came out again. Another exciting ride that ended safely. As Patty says, they should make a reality show about our trips! We had a good time at Sheyenne National Grasslands. The riding is easy for horse and rider. The campground was comfortable and had a great shower house and laundry. For those who don't camp, there are cabins and a teepee to rent. Yes, an actual teepee. For those interested in riding this area, there is a good website for your information. 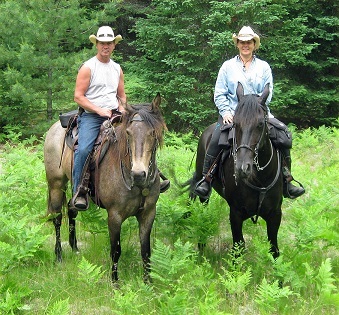 The Popple Ridge horse trails are located in the Chequamegon - Nicolet National Forest with the majority located Langlade county while the rest lies in Oconto county. This is District 2 of the Wisconsin Horse Council designations. There are over 20 miles of trail here and two places to camp and ride these trails. One place to camp is the Jones Spring area trail head on Setting Lake Road. It is on the eastern edge of the trail system. This is a rustic camping area with no amenities. It consists of two open spaces and camp sites are not designated. It is first come first serve. The horse trails are marked with white horse shoes on a brown background. The trails originating from this trail head meet up with the trails that are color coded. Which leads me to the second area to camp. 9 Mile All Sport resort, is a full service camping facility, located on the western edge of the trail system. This camp area is located on highway 55 and is privately owned. Water, sewer, and electricity are available at the campsites. You can set up electric pens or high line your horses. There is also a main building that has full facilities including showers, a restaurant and bar. There are even two rustic cabins to rent for those who choose this way to camp. 9 Mile has trails that meet up with the main trails in Popple Ridge. They can provide trail maps that are color coded to the markings on the trail. From here, there are four main loops. The red trail is the shortest at 3 miles. Next is the yellow trail, which is new and not mile marked out at this time. The blue trail, which is my favorite, as it contains a fun single trail track with lots of ups and downs, is about 9 miles. Lastly the white trail, which connects to the trail from the Jones Spring camping area, is the longest at about 15 miles. This beautiful area also contains hiking, biking, and ATV trails in the summer. In the winter there are crosscountry ski and snowmobile trails. Small fishing lakes are in the area as well as swimming so there is something for everyone in the family. 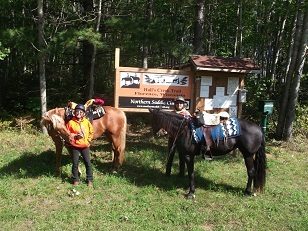 The Triple R Riding club from Antigo maintains the trail system. I think Donald Park is one of those trails that may not be well known in Wisconsin. I try to ride as many trails as I possibility can and I have had the pleasure of riding in Donald Park on many occasions. Donald Park is located 15 miles Southwest of Madison, between Mount Vernon and Mount Horeb. The Donald County Park horse trails are in the Town of Springdale, southeast of Mt. Horeb off Highway 92, just west of Mt. Vernon. The Donald/Woodburn family donated the original 105 acres for this park. The park has since grown to encompass 480 acres containing oak woods, intriguing rock outcroppings with scenic vistas and springs. Donald Park is also known for its trout streams; Deer Creek and Frye Feeder, and Mt. Vernon Creek. There is a small picnic area called Pop's Knoll developed through a generous donation from the Woodburn family and the efforts of the Friends of Donald Park. There are 3.5 miles of Multi-use Trails in the park. The trail surface is mostly grass, with some sand and short segments of gravel. There are an additional 17.5 miles of horse trail easements on lands outside of the park – both south of the park and to the north across Hwy 92, for horseback riding (Preachers Cap Trail & Devil’s Chimney Trail). Trails are in the area where rolling hills shaped by glaciers meet the more rugged terrain of the Driftless Area. Trails inside the park are 10′ wide, two-way, multi-use trails (horses, hikers, No Bikes). Trails outside the park vary from 10′ wide to smaller cut-off trails that are one horse wide unimproved, natural trails. Horse drawn vehicles are allowed — some trails are a little steep – proceed with caution. Trails are open for horses May 1st until October 31st. Trails are sometimes closed for various reasons please check the Dane County Parks website for current conditions. Info Line 608-242-4576. 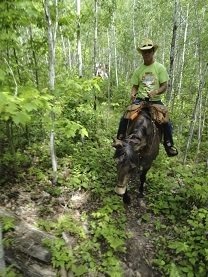 Trail Pass are required for Horseback Riding at Donald Park. Season Horse Trail Passes are $20 and $12 for seniors 65 or better. Each person who rides over the age of 16 are required to purchase a Trail Pass. A daily trail pass can be purchased at the Equestrian Trail Head Kiosk at the park. The trail pass is good for any of the Dane County Parks with horse trails. Many riders enjoy trail riding with their dogs, however, dogs must be on a leash at all times. There is no camping available at the park, so plan for a day ride. I typically ride in Donald Park a few times a year. Spring, summer and fall are all beautiful times to ride the trails. Different vegetation can be enjoyed depending on the season. The trails are very well maintained and offer a diverse riding experience. Since I ride a Rocky Mountain horse, I appreciate the opportunity to gait, and Donald Park offers several long stretches for gaiting. In some areas there are hills to provide some good up and down riding but your horse does not need to be very conditioned to meet the challenge. Those of us who participate in the Ride Wisconsin program are always looking for different trails to ride. If you live in the area and do not need to camp, I encourage you to make Donald Park one of your riding destinations. Underdown Horse Trails were developed in cooperation with the Lincoln County Department of Forestry and Parks. The trails are located about 10 miles from Merrill. To reach the trailhead from Merrill, take Highway K North for 8.5 miles. Turn right (East) onto Highway H, and then turn right (East) again onto Copper Lake Road. The Underdown Trailhead parking area will be on the right-hand side of the road. There are 20 miles of horse trails on this 44,600-acre Underdown Recreation Area. The Underdown is open to horseback riders during the summer. 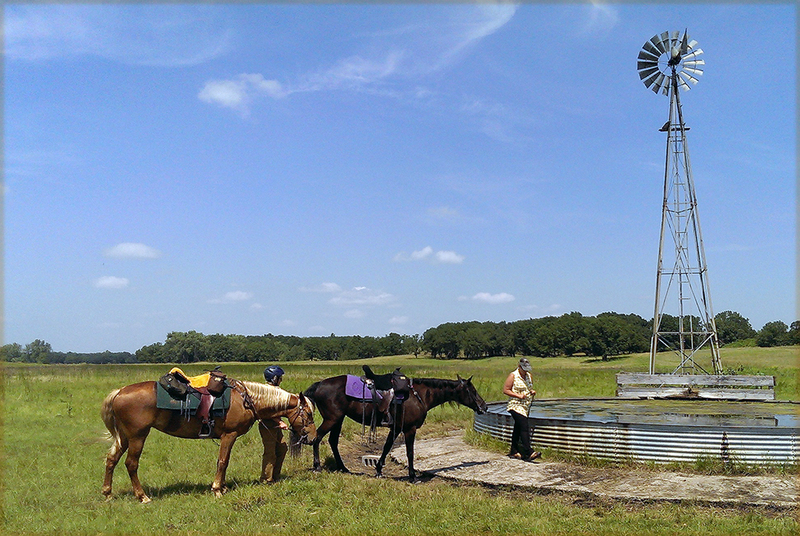 The horseback riding trail network is made up of 20, 18, 12, 10 and 3.5 mile loops, which are marked and maintained. There are trails for mountain biking that cross the horse trails, so beware of possible cyclist. The first time I rode at Underdown being unfamiliar with the trails, I stopped to get something out of my saddlebags only to find I had stopped directly in the path of the bike trail. My experience with the mountain bikers has been that they are considerate and accommodating. Since it is such a work out for my horse in many areas, I am impressed that mountain bikers actually ride the trails. The trails are beautiful, but can also be rugged and challenging. Riding my Rocky Mountain mare, I do not need shoes, but for horses with tender feet, you should know the terrain might be hard on their feet. The trails are very well marked and it was particularly clever to color code the same trail with different color when going in the opposite direction. It is pretty hard to get lost on these trails. The Underdown Horse Club maintains the trails. The Underdown Horse Club was formed in 1982 and chartered with the State of Wisconsin in 1983 as a non-profit organization. Under the laws of the Charter all funds and efforts of the Underdown Horse Club must benefit the Underdown Horse Trail system and Horsemen's Park and cannot be used for any other purpose. The sole purpose of the group is to assist Lincoln County in the development and maintenance of a Horsemen's Park and trail system in that part of Lincoln County known as "The Underdown". The Underdown Horse Club has contributed over $35,000 in cash and materials during its existence, paying for projects such as: well, toilets, campsites, parking lot expansions, tie-rails, and most recently a storage shed for trail maintenance materials (posts, signs, hardware and tools). The cash contributions are incredible but pale in comparison to the thousands of man and woman hours donated each year by the Underdown Horse Club's dedicated volunteers. Since 1982, the Underdown Horse Club volunteers have done all of the regular maintenance on the horse trails, spending hours clearing brush and windfalls, marking all of the different trails with signs paid for by the club and replacing markers when necessary. The club members average 300-400 hours of volunteer labor yearly so that the Underdown Horse Trail can be the best of the best. It is their efforts and commitment that make this trail system one of the finest in the state of Wisconsin. 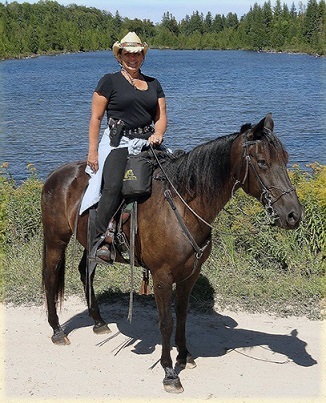 The Underdown has been the recipient of Wisconsin Horse Council trail grant money in the past and has put it to very wise use. In addition to the wonderful trails, The Underdown offers overnight camping for $15.00 per night. The Recreation Area Trail Head & Campground consists of one large parking area with year round hand pump well and wayside style pit toilets. If you are looking for an upper body workout the pump will certainly provide that. It is always a good idea to come prepared to carry water, but you will need to carry the water a fair distance back to the campsites. There is a smaller parking area with new high line tie rails for horses and group camping, as well as ten individual campsites designed for horse trailers up to 40ft tri-axle size. The campsites will easily handle motor homes as well. Campsites are on a “first come – first serve” basis. The Underdown has become a popular destination for horseback riders so the sites in the wooded area may be taken, but additional camping is available at the trailhead. Underdown Horse Trails open May 1st - weather permitting. Trail passes are needed but can be purchased on site. User fees for 2014 are $5.00 for Day Passes and $15.00 for a Season Pass. I make it a point of supporting each trail system by purchasing a season pass whether I intend to return or not. I make a point of spending at least one weekend at Underdown every year. I thoroughly enjoy the trails and appreciate the hard work that is put into maintaining them by the Underdown Horse Club. With the different loops in the trail system you can take a short ride or make a day of it. It may be difficult to find water on the trail for the horses, so I encourage you to carry a portable bucket if you are going out for the day. There are plenty of spots to stop for pictures or to have lunch along the way and even on the busiest of weekends it is uncommon to cross paths with either horse riders or mountain bikers. Given the beauty of the area and the excellent trail system, I recommend that you make The Underdown one of your riding destinations.